However, certain nationals may not have to wait 12 months to apply for a PRRA, in the case of a sudden change in country conditions. Please check the CIC website for the updated list of countries to which an exemption to the bar on applying for a PRRA applies. If you come from a designated country, you are not allowed to apply for a PRRA until at least 36 months have passed since your refugee claim or PRRA application. made a refugee claim but were determined to be ineligible for referral to the Immigration and Refugee Board because you came to Canada from a safe third country. Are subject to extradition, i.e. 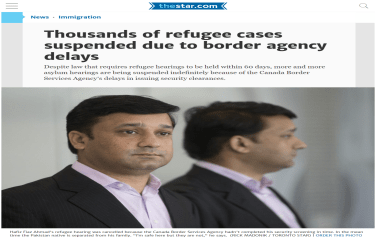 a formal request that Canada return a person to another country because they are a suspected or convicted criminal. If you are found to be eligible for a PRRA, you will be given an application form and a guide. You have 15 days to apply. If you receive the form and guide by mail, you will be given an additional 7 days. You withdraw or abandon your application. In your PRRA application, you must submit written evidence to show that you face risk in your home country. If you have previously made a refugee claim, the Officer will only assess new evidence that arose after you made your refugee claim or that was not reasonably available at the time you made your refugee claim. In deciding whether or not to accept your PRRA, the Officer will consider whether you face a risk of persecution, a danger of torture, or risk to your life or risk that you may be subjected to cruel and unusual treatment or punishment. However applicants who are inadmissible for serious criminality are assessed only with respect to danger of torture and risk to life/risk of cruel and unusual treatment or punishment. If your PRRA application is accepted, you will be considered a “protected person” and can apply for permanent residence. However, if your application is rejected, you must leave Canada. Rejected applicantscan apply to the Federal Court for a judicial review of the officer’s decision.